Dad was born at home on November 11, 1921. He was raised and lived his whole life in the Westwold Valley.He was one of seven children and was predeceased by his mother Nellie, his father Andrew J., his wife Georgie, siblings Jack, Mary, Janet, Ellen and Marg. He was also predeceased by his son-in-law Ron Klassen. He is lovingly remembered by his five children: Vicki (Gary), Susie (Ron), Kristy, Kathy (Earl) and Gordie (Elaine) and his youngest brother Val (Sandi). His family has since grown to include 13 grandchildren and 23 great-grandchildren. Dad joined the 1st Canadian Parachute Battalion and headed to Fort Benning, Georgia for training. He was sent overseas and on June 6, 1944, he jumped in the D-Day invasion of Normandy, France. He also jumped at the crossing of the River Rhine in March, 1945. By the end of the war, the 1st Canadian Parachute Battalion had gained a remarkable reputation; they never failed to complete a mission and they never gave up an objective once taken. Dad came home on the Queen Mary. Dad was awarded the France Legion of Honor presented by the Consul General of France at the Vedder Legion in Chilliwack. Dad is the last surviving veteran in his community. He returned home to Westwold and purchased a farm. He married Georgie Slater in 1949 and worked as a farmer, logger and hunting & fishing guide. 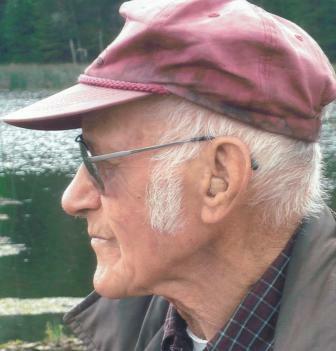 He also operated a fishing camp on Woods Lake where he and his family spent many happy years. Dad also maintained his own trap line. He was a president of the Royal Canadian Legion in Westwold as well as the Westwold Community Hall Association. He was a long contributing member of the community and was exceptionally proud of the Westwold Valley (aka God’s Country). An avid card and crib player, we all enjoyed many enthusiastic (competitive) games with him at family gatherings. Dad was fortunate that his good health, as well as his daughter Kristy’s endless dedication, allowed him to live independently on the original Pringle farm now owned by his loving brother Val and Sandi. The family would like to extend our sincerest gratitude to Dr. Howie, Dr. Chahal and all of the incredibly kind and compassionate staff and residents of the Ponderosa Lodge. A celebration of Joe’s life took place at the Westwold Community Hall on Thursday, January 26, 2017 at 2:00 pm. FAIR WINDS AND SOFT LANDINGS. I had the pleasure of meeting Joe a few years ago and played many games of crib with him at the Legion and whenever I saw him along the Lake road I always took the time to stop and say hello and he never forgot who I was. Sad to hear of his passing.